Roberta was born in Thompson, Manitoba, but her family relocated to Welland when she was young. While growing up in Welland, Roberta became an accomplished baton twirler with the Welland Rosettes. Roberta graduated from Notre Dame High School in Welland and worked in industrial and tourism positions before deciding to return to school to pursue a new career path. She enrolled at the Canadian Therapeutic College, where she obtained her 2-year diploma in Massage Therapy, with an additional third year of sports injury management. 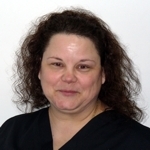 Along with her experience at the CTC massage clinic, Roberta has worked extensively with several elite sporting organizations, including the Hamilton Tiger-Cats, Judo Canada, the Ontario Karate Association, and national-level gymnasts. Roberta splits her work hours between Bridgepoint Chiropractic and B. Elliott and Associates in Welland. She offers a vast repertoire of soft tissue therapies including swedish massage, myofascial release, sports massage, shiatsu and reflexology. Massage prices can be found on our fees page. Gift certificates are also available. If you would like more information about massage, or to book an appointment with Roberta, please contact us.